Gigabyte’s new UEFI BIOS is particularly well-suited for building Hackintoshes. However, many of Gigabyte’s recent motherboards, including all of the MicroATX Z77 and H77 boards, use the VIA VT2021 HD Audio codec chip, which is not well-supported. In contrast, the Realtek line of HD Audio codecs are generally well-supported. The ALC885 and ALC889A in particular don’t even need editing AppleHDA.kext for the device ID. The Intel High Definition Audio Specification defines defines a standard 48-pin package for the codec chip, although it is “not a compliance requirement for all codecs”. It appears that Both Realtek and VIA codecs usually follow the standard package, so it’s likely they’re (almost?) pin-compatible. Update: The pin-outs of the ALC885 and VT2021 are the same. Since I’m building a Hackintosh with a GA-Z77M-D3H with a VIA VT2021 chip, I decided to work around the audio issues by swapping the VT2021 with a Realtek ALC885 chip. 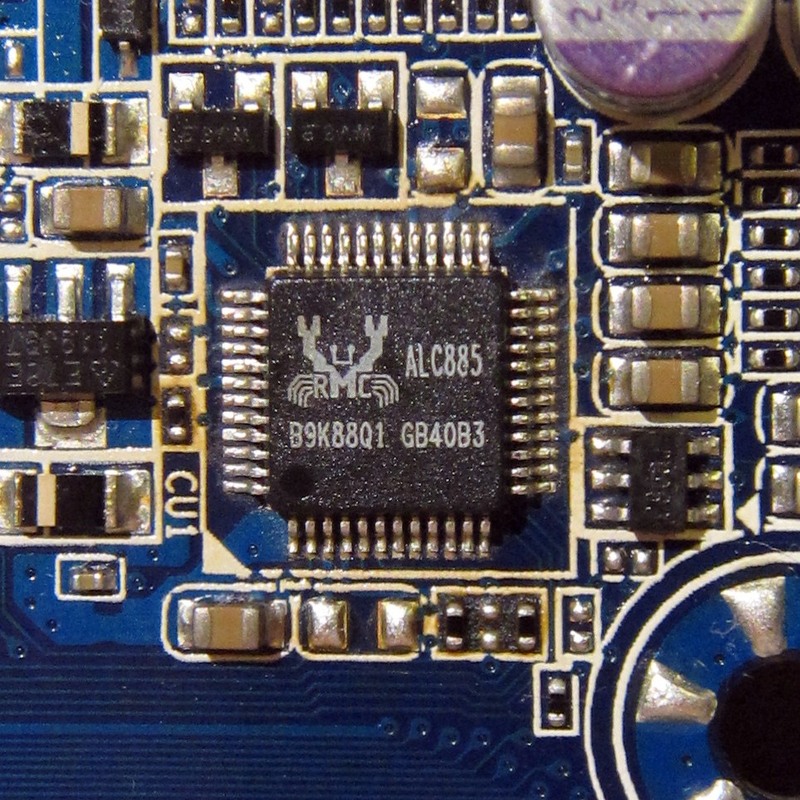 Here are close-up photographs of the removed VT2021 chip and newly-installed ALC885. Surprisingly, the replaced chip appears to work fine. It was auto-detected and configured automatically in Linux, and also works in OS X with the usual amount of headache. I have not rigorously tested whether all of the output ports work. Those that I tested (rear microphone and rear line out) work fine. WOW. This is a little more intense than I’m willing to try with an expensive motherboard, especially since I have NO soldering experience, but kudos to you for doing it. That’s one good way to solve the VIA annoyance! i just used a usb plug & play audio adapter from eBay. extremely cheap and an instant fix to my hackintosh with this mobo that was missing audio. I had no idea that codec ICs would be pin compatible but then I guess it’s nothing new. DACs from the stone age (80s/90s) were often the same. Can i ask where did you get the Realtek chip from? Was it salvaged from another mobo or did you specifically order one in? I got my codec chip through ebay, around $6. I just made an order for 2 of these on eBay. Hopefully I can hack it successfully when it arrives. Thanks! This is interesting. I got a Gigabyte Z77 board recently and it’s driving me crazy that the Via codec has an inability to fill out my missing center speaker to the front left & right ones. It’s good to know that replacement is possible (I have a ALC889a in my old motherboard). I’m not brave enough to try this on a motherboard this expensive though. It will probably work, but there does seem to be two pins that are different between the ALC888s and ALC885, pins 33 and 37 (from Realtek’s datasheets). Hello, Henry. I have a same MB you got. Do you using Clover UEFI install and boot Mountain Lion? Can you upload your newest patched DSDT and CLOVER CONFIG.PLIST files? Right. As far as I know, no UEFI boot, and no dual booting (OS X only). Wow, this is indeed impressive. Any idea if this can be done with IDT sound-chips? DELL use them, I have a Latitude E6530 and would like to replace it with RealTek, far superior on-board audio. I see on the IDT website they’re being sold off! Does this mean No more support for older IDT audio? Thanks a bunch IDT. Surely VIA, IDT, Realtek must use the same pin-out configurations? Would love to replace the IDT chip with a Realtek. Thanks in advance. You can’t really know without trying it, and I certainly haven’t tried it. All HDA chips should have very similar (though not necessarily identical) pinouts. You’ll need datasheets to see whether they’re close enough to swap without redesigning the motherboard. Hi, Henry. I have the same motherboard. After replacing the sound chip, can u update to the latest BIOS? I haven’t tried. I don’t see why it would be an issue though, unless the new BIOS specifically tinkers with the audio. I noticed the F9a BIOS described as fixed audio function under Win7/8/8.1/XP/Vista (* After update BIOS, please update VIA audio driver. I thought the BIOS has audio controller data or something. I want to replace with a ALC885 or ALC889a but worry about it maybe unstable. So after the replacement, is everything normal and stable? You mentioned the unusual heat, is that normal? I see. No, I have no experience with the new BIOS version. My guess is that it would work, since I don’t think the BIOS is involved in configuring audio devices. I’m not sure why it says you should update the VIA audio driver though. BIOS contains the Azalia Verb Table, which is read by compliant drivers to configure the audio chip functions and inputs/outputs. These tables are very often incorrect, and are overridden by the Windows driver shipped by mainboard manufacturer or the chip supplier. Thus with these drivers installed, in Windows this table has no effect. The recommendation to update BIOS and then update the driver is a catch-all. Updating the BIOS will fix audio for people running the generic driver which relies on BIOS tables, and updating the mainboard specific driver will undo the damage that the prior version of the driver might have done. On Linux in the last 10 years, pretty much all issues with Intel HD Audio compatible sound chip support has been traced back to incorrect verb tables, and the distribution drivers attempt to detect mainboards and soundchips and apply corrected tables themselves. I have the exact same motherboard (GA-Z77M-D3H) and was thinking of doing the same. I have a question about a problem I have on another board that uses Realtek 892. I removed the extra SMD Capacitor and I still get no sound from the onboard. Do you think if I replace the Realtek chip with the same one, it will fix the sound issue? I have a feeling that’s a resistor rather than a capacitor. It looks like it’s attached to pin 8 (SDATA IN). Figure 18 in the datasheet (http://www.hardwaresecrets.com/datasheets/ALC892-CG_DataSheet_1.3.pdf) seems to suggest that a 22-ohm series resistor would be expected there. It also doesn’t look like the stray resistor is in a place where it would cause any damage. I wouldn’t suspect a dead chip, and the soldering job looks good, so I don’t think replacing the sound chip would help. Have you tried debugging on the software side (is the chip detected? ), and tested all of the inputs and outputs to see if any of them do something? All the ports (Back and Front header) including the SPDIF ( Optical and Coaxial ports on the back I/O ) don’t work. Jack detection doesn’t work. Tested both AC97 and HD settings and still no sound. I used a multimeter to test the SMD resistor. It has a 33-ohm value. I kept and tested the stray resistor. I don’t mind tinkering around, so I wouldn’t mind trying to fix it. Replace chip next? The fact that the digital side of the chip works makes me think it’s even less likely it’s a faulty chip. (Still possible, but wouldn’t be my first guess). It’s hard to tell in your picture: Is the soldering on pins 25-36 ok? I can’t quite tell if pin 35’s pad is corroded. You might check if the various power pins have reasonable voltages (including the LDO and VREF outputs), and see whether the signal pins are actually connected to the jacks? No, the Realtek should be cold to the touch, ambient temperature. The regulator shouldn’t put you into that much trouble either. One possible reason for it to get hot is if it goes into radio frequency oscillation on the output operational amplifiers. 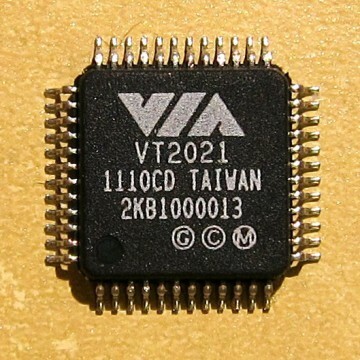 It might be designed for a resistance or an inductance on all or most of the outputs close to the pin, which VT2021 might not care for, being taped out more spaciously or including internal stabilization. Oscillation will also result in a degradation of distortion. Chances are, some of the small SMDs on the board are 0-Ohm resistors for the VT version of the board and valued components for the Realtek version. Hm… plausible, and I don’t have enough expertise to rule this out. But I think this is unlikely because the Realtek datasheet doesn’t mention anything about this. Also, it’s hard to imagine an amplifier designed to drive an open circuit wouldn’t be able to drive an open circuit (The case I tested with is with no load attached to the outputs). If you look at the Realtek datasheet that you link, page 93 Figure 2, look carefully at Jack D figure. It shows DC decoupling capacitor and then a ferrite bead inductor and then yet some capacitors to the ground. The DC decoupling one is obviously a must in any such system, but the rest? I thought for a second that the rest of the capacitors have something to do with Jack Detect, but looking at the Figure 19, i don’t think that’s the case any longer. The only purposes i can think of for the ferrite bead and the other capacitors is either to stabilize the output against oscillation or to protect it against injected currents. I can’t see such in the data sheet for VT2021. This might be true for Figure 20 (rear jacks), but in Figure 19 (front panel jacks), the ferrite bead is on the cable (i.e., usually part of the case), not the motherboard. The DC blocking capacitor is before the header for the cable, but everything else is on the cable. Its interresting info… I have ASUS P5Q Deluxe with fuc++ing ADI2000B codec… I want something with Realtek, because i need something with DDlive or DTSconnect… I looked to pinouts and looks nearly identic, but i have fear, that BIOS on the MB dont recognize another Codec… You dont need other revision of your BIOS??? I have GA-z77x-d3h and want to replacing the vt2021 with alc885 too. I just want to ask what the best temperature on blower (solder gun) to mak the solder quick melting but not make the component damage? Are the jacks not detected at all, or is the wrong jack detected? Within one jack group (4 jacks sharing one jack detection pin), ALC887 uses 39.2Kohm for port A and 5.1Kohm for port D, while VT1708S seems to use 5.1K for port A and 39.2K for port D (at least, if “J4” actually means “Port D”). If that’s the case, I’d expect the (back panel front speaker) or (front panel headphone) will be detected when you plug something into one of the “surround” speaker jacks (Plug something into port A to trigger port D, or plug something into port H to trigger port E). Well, most of the pins are for the analog side of the chip, so I’m not entirely surprised that the digital side still works after some damaged pins. I think you really need to get the jack detection to work correctly. As far as I can tell, the chip doesn’t actually output audio unless it detects the jack being used. Have you tried plugging a jack into other ports to try to trigger the jack detection? On this particular board, on Windows, I think audio comes out of the rear green jack if something is plugged into the rear blue jack to trigger the jack detection. If your motherboard already has the 10-pin front audio connector, it’s probably already wired correctly. Perhaps try testing the existing wiring first. The right side of Figure 19 is not part of the motherboard. It’s part of the cable and jack on your computer case, so you probably don’t need to do anything other than attach the connector to the motherboard. L14/L15 are probably ferrite bead inductors. It looks like L14/L15/C41/C42 are used to filter out high (radio?) frequencies, so they’re not entirely necessary for basic functionality. If you want to use Jack E and Line 2, I think you should check whether pins 5 and 9 on the motherboard’s connector actually connect to a ~100uF capacitor that then goes to LINE2-R and LINE2-L on the chip (pins 14 and 15). Also make sure this part of the chip wasn’t the part that was damaged. (Also check the AVDD* and AVSS* pins. They may be analog power pins that power the analog portion of the chip.) The 100uF capacitors (C38/C39) are probably necessary: They block the DC offset from the output pins from reaching the audio output, but you’ll still hear something (and a loud pop?) if those are missing. Can I replace via ic to related sound ic on my end g41t me motherboard. Unsure if you can (if it’s a somewhat standard HD Audio chip, it might be possible). It’s usually a very bad idea to do so, because you typically lose some audio channels and might get some of the audio pins swapped.